A few mornings ago, I woke up early but remained in the cloud of a dream. A good dream. It was a holiday, but I don’t recall which one. The family was all downstairs in my parents’ home. Not the entire extended family, just a chunk of the closest cousins, aunts, uncles. I’d just woken up and walked downstairs, saw my mother in the kitchen, and I could hear my cousins in the family room watching television. No idea what they were watching, maybe they were playing a game instead. There were large plants I didn’t recognize that were supposed to be Christmas trees, but I know they weren’t because, come on, and also I don’t think it was really Christmas even in the dream. The house is laid out in such a way that there is an upstairs and a downstairs. Upstairs are the bedrooms. When you walk down eight steps, you reach “downstairs”, which is the common living room and kitchen. At the other end of the kitchen are three steps that take you into the family room, and on this level is also the garage. Then there is a basement below that. I walked through the kitchen and started down the three steps to the family room when I heard a laugh, familiar and one I hadn’t heard in a long, long time. I reached the bottom step and instead of walking straight towards the family room I turned to the left, which is a small corner that, in my dream, held one of the Christmas plants and an armchair. I stalled. I panicked a bit, in my dream. I was caught off guard. My grandfather passed away in 2001. Grandpa, in the dream, had mostly black hair with only streaks of silver. He wore glasses and smiled while sitting in the armchair, just like he used to appear to me when I was younger and visiting the grandparents’ house. We spoke a bit, but I can’t remember what about because around that time my alarm went off and I woke up to reality. I purposely hit the snooze, even though I was running late, because I wanted to visit with him, and indeed I actually slipped back into the dream for a few moments longer. I don’t think we talked any more. I think, in the dream, I went to sit with the cousins and enjoy time together, but would look over my shoulder every few seconds in disbelief, Grandpa in his chair smiling at us. Even in the dream, I knew it wasn’t real. But it was nice for a while to imagine it was so, and to hear that laugh again. As the plane takes off all that you hear is the buzzing engine spewing a moody hum, and you feel the vibrations of the entire Skyvan stretching as it climbs to 12,500 feet. Your ears pop and you have to brace yourself against the seat or the wall of the plane as you wait through the 2o minute climb, but the anxiety you may have felt on the ground is fading slowly as chatter begins to dissipate. Jokes shared moments before are distant memories, and no one dares a glance out the window — instructors or students alike in this. Soon the time comes to get connected, so you shift over and sit on your Instructor’s lap. It’s uncomfortable, not only because the space is tight but, well, sitting on a grown adult’s lap while you yourself are an adult is a little bit of an odd move if the candles aren’t lit. There’s also an impression on your leg muscles as you balance yourself and brace against both the pull of gravity and the tug of straps as your Instructor tightens your harnesses together. There’s a gust as the rear door of the Skyvan opens, and the people towards the rear of the plane casually leap out and disappear. They’re the advanced students, instructors, and other “pros”. There’s a line of four-legged tandem Instructor-student creatures who start to walk awkwardly. You’re in front of your Instructor as you step together; a person learning to walk, and his shadow. You approach the door, and he tugs your head back so you look at the ceiling. “Hold onto your shoulder straps, lean back. Kick up your legs behind you.” He shouts this for the fourth time since you met on the ground a half hour ago, safety tips for making a good jump. Just for a second, but instead of landing on the ground you suddenly do a back flip, remembering to hold on tight to your shoulder straps and kick up your legs behind you. As you tumble through the air, Instructor helping you adjust so you face the ground, the Instructor taps you on the shoulder, and you LET GO of the straps. Air blows past as you spread your arms and continue to fall. You open your eyes, and the earth is two miles below, but looks like a high-res Google earth panorama, unmoving but very real. You catch your breathe, and it’s a struggle. Not only is air blowing against your chest and stomach, but the harness has been strapped tight, your jumpsuit is a half-size too small, and there’s moisture everywhere. It’s almost like forgetting to hold your nose when jumping into the deep end of a pool for the first time ever. There’s not a bit of amazement lost. A sound like snapping a sheet across a bed, the fabric quickly unraveling and sighing. The parachute deploys and you feel a tug at your thighs and shoulders. You dangle a moment, and the Instructor tells you to hold onto the straps dangling from the parachute. You could use them to steer, but for now, just hold them in place as the Instructor loosens a couple of the harness connectors between you. Legs dangle freely, arms are held at length to feel the gentle breeze as you glide for ten minutes towards the earth — again, a hi-res photo zoomed in, the land approaching at a crawl. Minutes later, your feet are falling asleep and your arms feel bloodless, pins and needles crawling under your skin to just be back on the ground, or, even better, falling freely once more. The clouds above and in the distance take on a more crisp sort of white-grey color, untouched by smog. There’s Lake Elsinore in the distance, and the small patch of green grass which serves as your landing target. You hear an adjusted flapping of the parachute, and the sound of a rope being tugged through a small ring, and suddenly you spin in a wide 360 degree turn. And again. And again, as your Instructor manages to steer through what he calls “thermal winds” to get you better angled for landing. You stretch your legs straight ahead when he tells you because, almost by surprise, the ground is coming up fast. Too fast. But not dangerously so. The ground approaching means you’re approaching the ground, and the experience is coming to an end. You slide across the grass as you come in for the landing, like sliding into second base casually. Shake hands, gather parachute, and walk on wobbly legs — weakened from the harness cutting off some blood flow, but also because why walk when you can fly? The rest of the day — weekend — week — you think of these moments and you smile, a serene cocktail of adrenaline rush comes over you, like you’ve walked through a refreshing water mist on a hot day. I debated internally (it’s a war zone in there) what this “New York Tale” should be. I haven’t written one up in a while, and I should frankly be getting more of these out to you given the fact that I’m only here a limited amount of time, and I’m a “displaced” LA dude so there should be a new perspective to the City here. 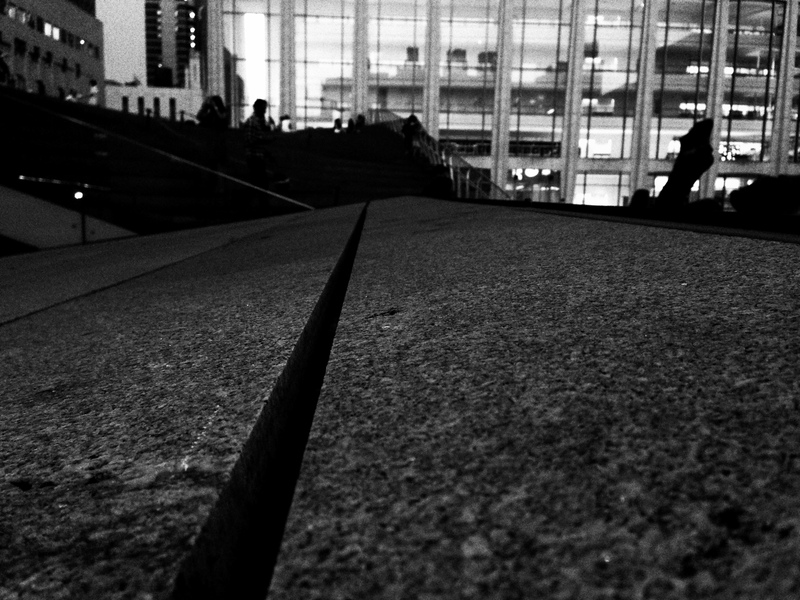 But what story remains about the Big Apple? I could tell you a little about this bagel shop around the corner from my current residence, which has become a consistent hangout and writing location over the last few weeks. The wood tables with easy access to power outlets and limited nighttime customers means this is a joint in which I can focus easily. The bagels come in numerous flavor varieties, as do the cream cheeses — 30 in total, and a weekly flavor of the week (this week’s is Four Berry, last week it was Mojito). Or perhaps I could tell you about my nightly frustrations with the N or Q subway lines, which inevitably get stuck one stop away from my stop during rainy nights, leaving me to walk the remaining mile in the rain sometimes without an umbrella (thanks, Apple, for lying about that weather again). One of these nights was after a rather lengthy bus ride back from Boston, it was after midnight, and I’d gotten a sunburn from a beach visit. Walking home in the rain with a sunburn is not the kind of refreshing walk in the rain that Owen Wilson desired in Midnight in Paris. But I think I’d rather talk a few minutes about the Great Escape. Unfortunately, I don’t mean the amazing movie starring Charles Bronson and Steve McQueen. 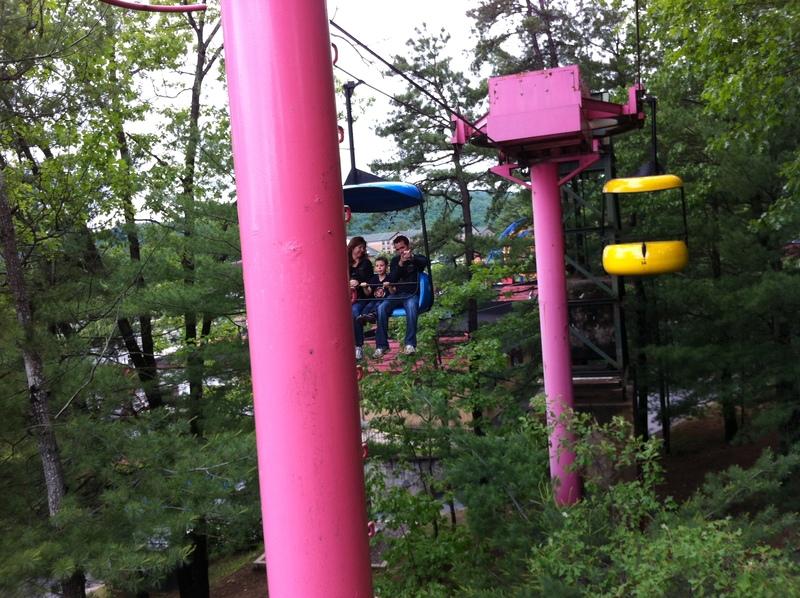 No, I mean the (Six Flags) Great Escape Fun Park in upstate New York, just outside of Lake George. This park has been around since before I was born, and was essentially an amusement park built around a “story town” which took classic fairytale characters and locations and allowed children to roam free within them, as though they were a part of the story. When I was much younger, my family and I would venture once a year, maybe twice if my brother and I behaved, to this story town adventure park. The Balloon ride, the Condor, and of course the Scrambler and the Steamin’ Demon — all of these rides in their own ways represented our ages. The balloons were shaped like hot air balloons and was essentially a mini-Ferris wheel — the kind of ride my dad was OK to go on. This and the actual Ferris wheel were the basics — kids with parents, listlessly flying through the air in very controlled, very protected little carts. The Skyride was next, a carriage of sorts that takes you over half the park at a slow clip, couple hundred feet in the air. The highlight of this ride was scooting past the water show which happened a couple times a day — a divers who would entertain kids and families, climbing higher and higher to smaller and smaller diving boards, jumping into a deep pool each show. Next on the list of rides was the Condor, which went probably a hundred feet in the air and circled at a medium pace. The ride consisted of three “arms” each holding about five vehicles for most ages and heights. The vehicles were painted like the heads of Condors. Your arm’s set of Condors would follow the others in circles, over and over and over as the ride took you up in the air. If you and your family venture to the Great Escape on a hot summer day the best way to keep cool is to hit the Raging River and the Desperado Plunge. Both will get you wet — these days more-so than years ago, as though not enough people were getting wet and thus were left dissatisfied enough to complain and force the park to build more spouts of water. 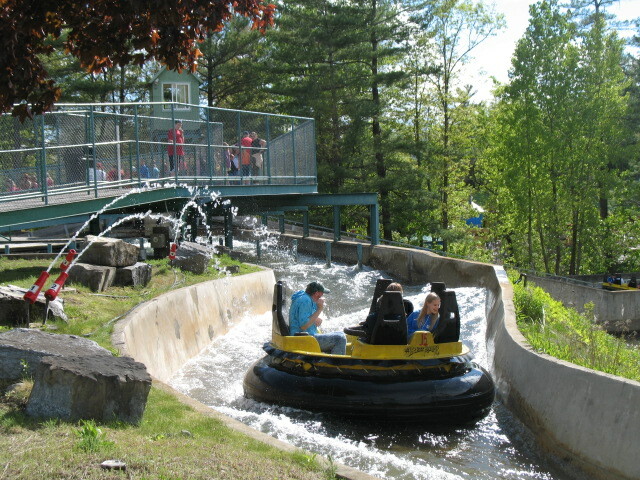 The Raging River puts eight people in a round raft, which turns round and round down a “river” track, splashing water into the raft, drags you under the trickles of waterfalls, etc. These days there are spurts of water that eject from the grass, and I only recently discovered that this water is ejected because kids nearby, watching the ride, actually pay to control these spurts. The other water ride, the Desperado Plunge, is basically a log ride, wherein you sit in a boat/cart shaped like a log, and flow up and down along a track until the final plunge, at which point pretty much everyone in the log is guaranteed to get a little wet. For the “big kid” rides, and the main focus of Ms. Johnson’s physics class in high school, we had the Steamin’ Demon — the original coaster — and the Comet — a wooden coaster added just before my high school years. The Steamin’ Demon is that classic ride I’ll probably never forget, my first upside-down roller coaster, and the focus of pretty much every kid to visit the park, ever. Orange, yellow and green, the best time to ride the Demon was at the end of the day, the last five minutes the park was open, as the folks controlling the ride would let you circle around two or three times if you were on the last train. The Comet is rickety and a little frightening, but still manages to thrill because you’re just thinking the entire time “when will this fall apart”? At some point along the way another thrill ride was added, the Boomerang coaster, which started in forward motion, went on a few loops, then ran backwards along the same track. Didn’t hold the same aura as the Demon for me, though. This trip to the Great Escape a few weeks ago was the first time I’d been in 7-8 years. It’s still much the same, from the Story Town structures to the skyline, the train ride, and yes, the coasters. I spent time with my family, including my new sister-in-law and her son, my brother’s new stepson. This kid is four and a bucket of energy, and as it was his first time at the park I got to see things from a different perspective. The kid’s eyes lit up multiple times throughout the day, either in wonder or in fear. He even won a prize at a game, a stuffed red turtle, which he proceeded to carry around by holding it at the neck. At one point, most of us went on a mini-coaster, a train which to be honest went pretty darn fast around a track in a mining setting. (The only member of the party not to ride was my father, who chose instead to watch the ladies’ bags and take pictures.) As soon as we disembarked the ride, my step-nephew (is that even a thing?) demanded to ride it again, but wanted to ride with me. I cannot express my fear at attending this ride alone with the kid. On the one hand, he was too shy in that moment to go super crazy and misbehave, as most kids do, so I was sort of blessed in that short time span. 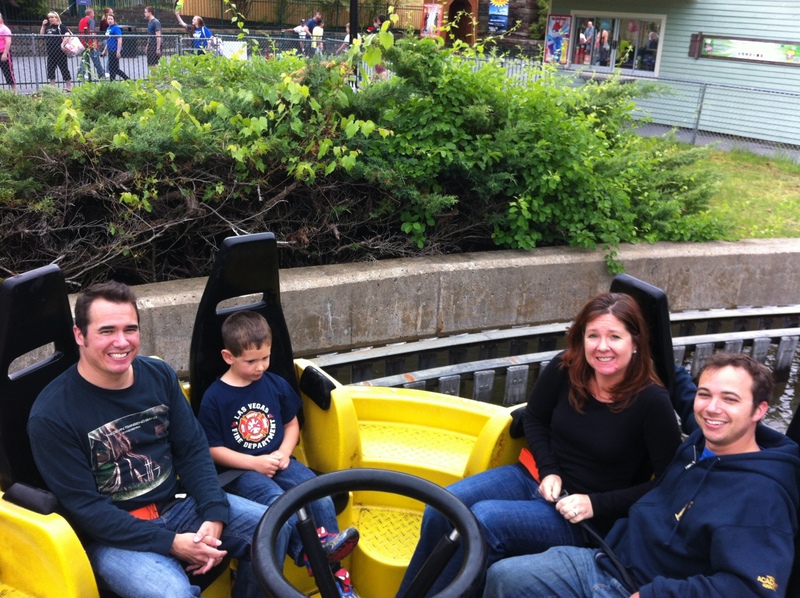 On the other hand, holy crap my brother and his wife are now trusting me to take this kid on this crazy ride. What if he cries? What if he trips and falls? What if he poops his pants, or picks his nose and rubs a booger on my eyeball? All sorts of crazy thoughts, and at one point I was terrified the kid would slip right off the ride and into the bushes below. But we survived, and fear left the park. The rest of the day, short lived as the afternoon became, was a cinch. I eased up and relaxed a bit more, despite my earlier tension around the kid. My brother and my family know that I’m hesitant around children, just the kind of uptight, stressed dude that I can be. But this tiny experience was a wave of new consideration, so to speak, that I’ll have to get used to kids some day, might as well start here. My brother’s a great dad, his wife a great mom, and our own parents (“Gammy” and “Chippy”) are super grandparents. The beauty for me of living so far away from them means that when I visit home it becomes an even greater escape than those trips to the park when I was a kid. 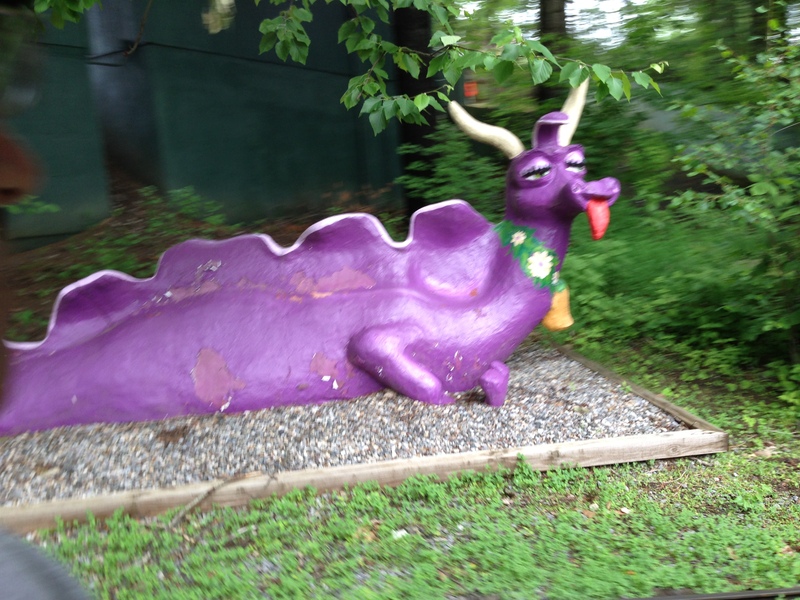 Oh, and this purple dragon is still there.